The Lord of the seven hills is the Lord of the universe. The special significance of Lord Venkateswara temple at Tirumala lies in the fact that it is the oldest religious institutions in the world where unbroken religious worship is being carried on for over 1,500 years by revered Acharyas and millions of pilgrims reach the holy abode more than any other temple in the world .The temple is held in high veneration by many devotees. The average number of pilgrims who seek Lord’s darshan ranges from 50,000 to 1,00,000 and more daily and on festivals double this .The emotional outpourings of the great Azhwars makes one rush to this sacred hills to have HIS darshan . Mere listening to the emotional compositions of his noblest and humblest devotees, like Annamacharya Tyagaraja and Purandara Dasa suffices. They combine the quintessence of the Vedas and the Upanishads. Everything begins and ends or is reduced to sunyam (nothingness) before him, while the infinite world pens to the sincere seeker with an infinitesimal offering. This is because spiritual wealth through devotion is the basis of life . venkateSa samo devo na bhUto na bhaviSyati! either in the past nor in the future……. who shall equal our Lord Venkateswara. Tirumala is one of the seven Swayam Vyaktha Kshetrams . Tradition has it, that hands of man did not work for the dhruva bera ( Main deity ) of Lord Venkateswara . This ageless temple of Lord Venkateswara is located a top the Tirumala Hill at an elevation of 3,000 feet . The abode of Lord Venkateshwara stands unique as an embodiment of man’s eternal quest for the divine and seeking His infinite grace. A pilgrimage to the sacred Hills is a soul-stirring experience cherished by every devotee. Even atheists and rationalists admit a sense of humility and the presence of the Lord here . As one approaches the inner sanctum , a strong pull towards LORD is experienced. The soul identifies its existence in this body and regrets its foolishness in remaining in several bodies for several births and ignoring HIS love for us. Lord Venkateswara is glorified as Pratyaksha Daivam (manifest divinity) who helps all his devotees in distress . At all times past, present and future ……..
Will I ever let you go? so far-reaching, with the fragrant cool garland of tulasi leaves ……. You grace the cool Venkata hill. Few come out with rain of tears and a few feeling relived, and a few want more to just be there looking at HIM.. …. All men irrespective of religion, status, caste, and creed make several trips in their lives to worship the LORD, as they are our divine parents for ever. At Tirumala apart from having sarva darshanam , devotees participate in daily Arjitha sevas such as Suprabatha seva , Thomala seva, Archana Seva , Kalyanaotsavam, Arjitha brahmotsavam, dolotsavam, Sahasradeepalankarana seva , vasanthothsavam, Ekantha seva conducted at different times in a day . Apart from the daily seva , weekly sevas that comprises of Vishesha pooja on Monday , Ashtadalapada padmaaradhana on Tuesday , Sahsrakalshabhishekam on Wednesday, Thiruppavada sevai on Thursday and Abhishekam ( Vastralankarana sevai ) on Friday conducted in a grand manner . 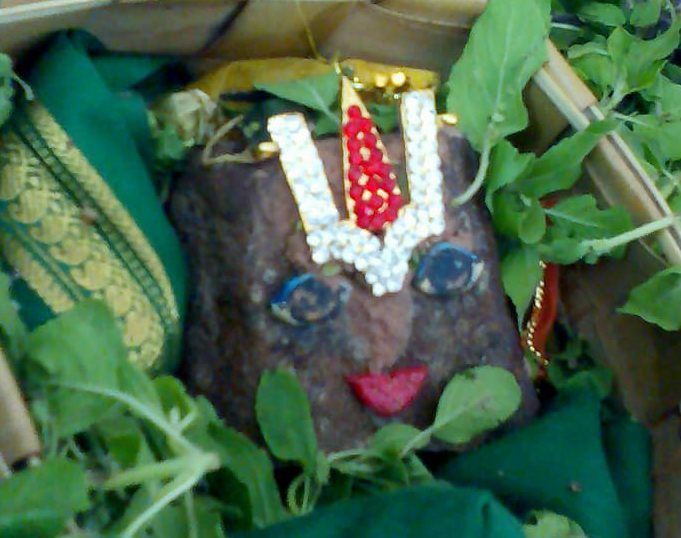 For this wonderful darshan the devotee is supposed to report one day in advance on Thursday. On Friday early hours around 2 AM, the ubhaydhaare reports at Vaikuntam queue complex for Arjitha seva ticket verification. we walk in the queue…………. Lotus feet !! tad-vishhNoH paramaM padaM, says the Upanishads meaning the Divine feet are the supreme..
caraNaM pavitraM vitataM purANaM yena pUtas-tarati dushhkRtAni. The absolute sense of surrender echoes the feeling that we have none other to protect us other than our divine parents and seek their lotus feet .Our karmic parents , husband , wife friends even the demi gods will not be able to rescue us and it is LORD SRIMAN NARAYANA alone who can take care of us all the time .The divine feet constitute the ultimate solace for all sorrows. The holy feet which walked on the ground had impressions they called it as samrajya lakshanam . 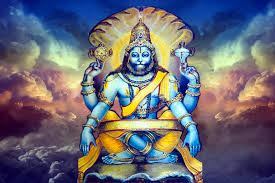 All those divine marks on the soles of his lotus feet , those lovely impressions were visible on the ground in gokulam . Sree Vishnu sahasranama Sthothra, is a garland of the thousand divine names of Lord Vishnu, strung into a beautiful sthothra by the legendary Rishi “Veda Vyasa” , acknowledged as one of the greatest exponents of the Vedic wisdom. The first 13 stanzas are the dialog between Yudhisthira and Bhishmacharya . The next three stanzas are the customary Dhyana verses…. It is said that in Veda Vyasa’s 149th chapter Anushasanika Parvam of the Great Epic Mahabharatha, the Vishnu Sahasranama Stotra, the 1000 names of the Lord Vishnu are written..
….Sri Vishnusahsranama ..………a divine gift from Bhishmacharya ………………..
After the great Mahabharata war, as per destiny , Bhismacharya was lying on the bed of arrows . He was letting the world know that he was waiting for the auspicious time [punya kala] for the sun orienting its direction northwards [Uttarayan] for leaving his mortal body. 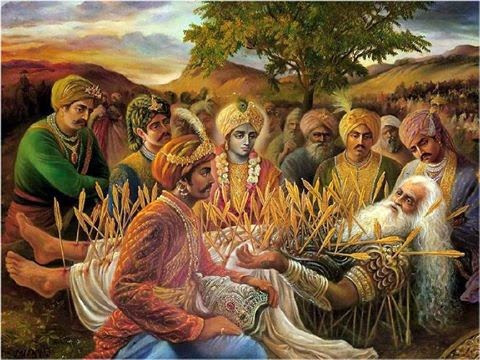 Deep inside his heart he was praying Lord Krishna to bless him with his darshan during his last moments of his life . 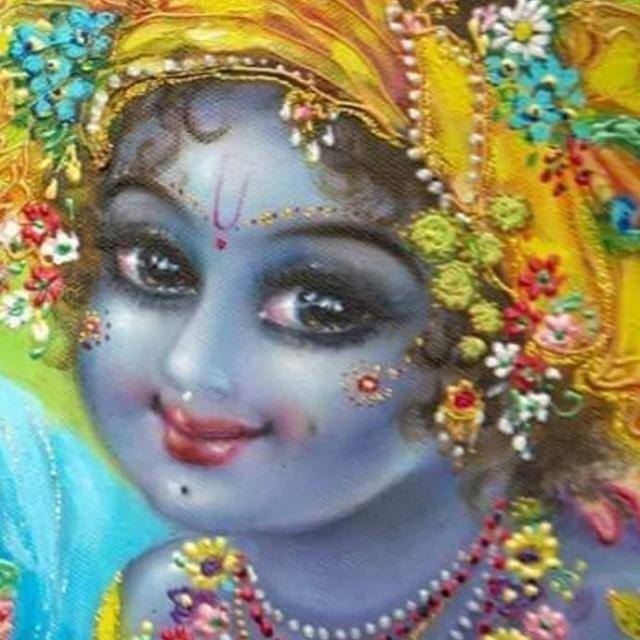 Bhismacharya was patiently bearing the pain and being a nice devotee had the firmness not to ask the lord for relief and instead waited for the Lord to grace him . The lord also acted in the same way as his devotee. 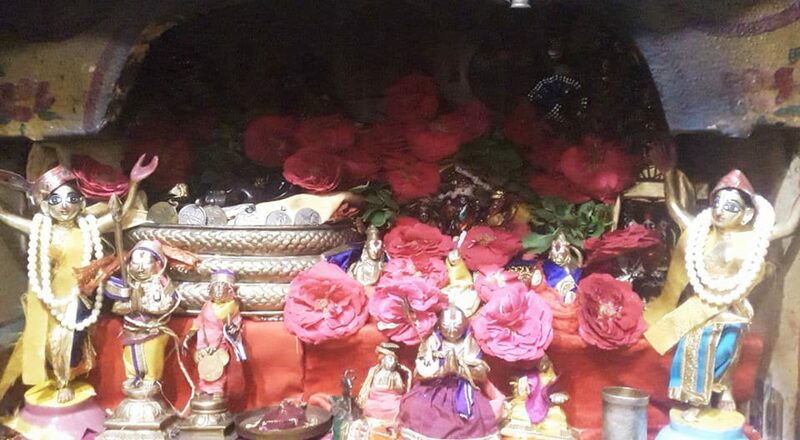 Since Bhismacharya did not directly call upon Lord , the Lord also decided that he will not use that as a direct reason for giving him his darshan.